Corporate - Epic Cycling Events, motivational speaking, indoor cycling instructor, cycling coaching, personal rides, training plans. Walton Endurance (WE) is a business dedicated to working with corporate clients who realize the power of a bike ride. WE also make individuals faster, stronger & more efficient cyclists. WE welcome everyone who values the 2 wheeled machine: www.waltonendurance.com When you bring individuals together to achieve a common goal, WE know it's more than a bike ride. 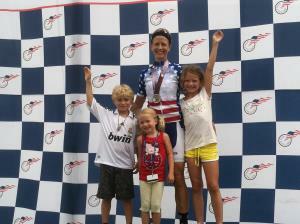 As an active mom of three children who races and is involved in the cycling community, I am best at guiding others to do what I do best and that is manage my time and play up my strengths. I am a master at creating a high quality, engaging training program for those with limited time to train. I love helping people get started in becoming active as well as guiding those to use their workout time wisely and reach a specific dream. I've been involved in the sport of cycling since 1993 and have earned each road race title (state crit, road race and time trial champion). In 2011, I went to the Master's Track Cycling World Championships and won all 5 events (500 meter TT, 2 km pursuit, scratch race, points race and sprints). In 2013 & 2014, earned 3 more World Master's titles. In 2012 and 2013, I was the PA BAR Elite champion. In 2015, I was National Champion in the sprints, 500TT and points race and in scratch race 2017. In 2016, I won the 45+ National Championships Road Race. My love of the sport & my desire to share my knowledge & experiences is what keeps me cycling year after year. I have a sincere desire to help anyone who wants to make cycling part of their daily routine. Helping a client realize that they are stronger than they think is more important than any title. I've certainly learned that the bike is a powerful tool for living your best life & I love guiding others to make that same connection. If you have a dream and you believe, then your dream can come true. Success. Coach Dana Walton has been notified of your message.